Although sometimes brought on by severe immunodeficiency problems or when a course of antibiotics has wiped out some of the other bacteria which keeps our internal systems balanced, generally, we only experience candida as a problem when we eat poorly. Unfortunately, this is how most people in the western world eat virtually all of the time, leading to much confusion. Sugar is the food of Candida. As there is always some sugar in the blood, there is always some candida present. It's supposed to be in our bodies, and it's always around. But when blood sugar levels rise too high, candida rapidly reproduces to feast, which drops blood sugar levels. This is actually great news for us, as high blood sugar causes all kinds of problems in the body. Candida is escentially saving your life when it goes all out and does a large-scale bloom. Once the combination of the candida bloom and the natural uptake of sugar into our cells has lowered blood sugar levels, within a matter of hours the yeast will quickly die off, returning to its normal levels and causing us no more problems unless blood sugar levels once again rise dangerously high. Obviously, having a bunch of yeast growing in our body isn't the most pleasant thing, but it's doing us a favor. If you don't like candida, then you need to stop eating in way that causes prolonged high blood sugar levels. A standard candida treatment generally centers around lowering the amount of sugar you're eating (especially from fruit), something that almost universally backfires for the same reason that those eating less sugar do not escape their type two diabetes. Lowering sugar intake to lower blood sugar does seem reasonable at first, but not if you understand how the body functions. Sugar fuels every cell in your body, from those that make up your muscles to those that form your brain. Trying to starve your body of sugar is like trying to kill your cells. If your blood sugar ever reached zero you'd die. When people manage to lower their blood sugar levels by taking in less sugar, they usually feel quite tired because they've lost their main fuel source. If you decide to reduce sugar intake, you might feel better because you're removing the fuel for the yeast, but if you believe you've cured yourself of your candida problem you're confusing a symptom with a cause. Sugar did not cause your high blood sugar, fat did. Our bodies need fat, but very little of it. When we exceed this amount, our health and vitality tends to decline in a number of areas. One of those areas is blood sugar, which gets too high when we're eating a lot of fat. For a detailed look at exactly how fat causes blood sugar to rise, read this article. Simply put, the more fat you eat, the longer it takes for sugar to get from the blood stream to your cells. If sugar can't get to the cells, it's sitting in the blood, effectively raising your blood sugar level. This is bad news for the average American, who averages 33 percent of his or her calories from fat. Those who eat a lot of fast food and junk food may get more than 40 percent of their calories from fat. Salad of one head lettuce w/ 6 tablespoons of dressing: 73 percent. The average raw food diet may be uncooked and undamaged by heat, but it is not healthy. Raw foodists often find themselves looking for a candida cleanse more than anyone else because their blood is so clogged with fat. Oils, which they drench their salads with and add to smoothies and other concoctions, are 100 percent fat at 100 calories per tablespoon. Nuts are high in calories and 60 to 90 percent fat. Avocados are 77 percent fat. It adds up pretty quick. Some estimates put the average raw food diet at 60 percent fat or more (3), a level of that is usually only matched by those on meat-centered diets like Atkins, which have proven quite dangerous for their adherents. I recently consulted with a low-energy, craving-prone, candida-ridden raw foodist through my coaching program who boasted to me that he was averaging 80 percent of his calories from fat, living mostly off greens, oil, avocados, and nuts, with little fruit. 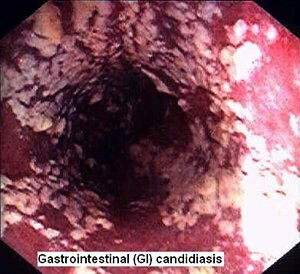 He was confused why, if he was eating so little sugar, he was suffering so much from candida. Sinfully delicious low-fat raw dressings can spice up your salad every night of the week without causing candida. With fat levels this high, blood sugar levels are perpetually elevated, and candida frequently becomes a regularly-recurring problem. These raw foodists start obsessing over sugar and fruit, trying to root as much of it out of their diet as possible, robbing themselves of fuel and making themselves feel even worse. Numerous studies have shown the most effective way to lower blood sugar without the use of drugs or insulin is by eating a low-fat diet. If your blood sugar levels are not elevated, candida won't bother you. Type two diabetics who eat diets averaging 10 percent of calories from fat and under have their blood sugar drop considerably and are usually able to ditch their insulin and medications. This level of fat is suggested by a number of excellent diet-focused medical doctors, such as John McDougall, Dean Ornish, and Michael Klaper, and is healthy and sustainable. Animal foods like meat, dairy, and eggs are all too high in fat to eat in any significant quantity on a low-fat diet. Similarly, oils and fatty nuts and avocados won't work. 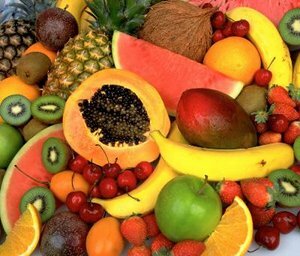 What works best is a carbohydrate-rich, low-fat diet of whole raw fruits and vegetables. This sort of regime will normalize your blood sugar in less than a week, an impressive feat. Learn how you can eat a healthy raw food diet that will let your thrive and escape disease here. If you're looking for a candida treatment, you might hear about some other options, which I'd like to discuss here. The idea behind probiotics is to recolonize your body with helpful bacteria that may have been wiped out through antibiotics. Many women have used yogurt (which contains lactobacillus) to treat yeast infections for years, but probiotics in pill and liquid form have become popular recently too. Unfortunately, there's little evidence that probiotics have any significant impact on yeast infections in women (4, 5), and are unlikely to be an effective candida treatment because they do not remove the underlying cause of the candida flare: fat. Eating no food and drinking nothing but water is an effective way to clear a candida thrush, but it's unnecessary and unsustainable. On this regime fat will clear the bloodstream in less than a week, your blood sugar will return to normal (if low) levels, and the problem will be gone. Yet, you have to eat eventually, and what will you put in your mouth? If you eat more of the high-fat foods that caused the problem in the first place, another candida cleanse will be needed sooner or later. Pick a diet that works so you can actually function in your day to day life and will not require a fast. 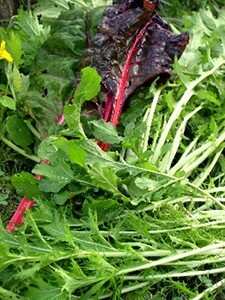 Another common way to ditch candida is to eat nothing but green leafy vegetables. This will work, but once again is it not sustainable. Greens are very healthy and low in fat, and your blood sugar will quickly return to normal, but a head of lettuce will give you less than 100 calories. The volume of your stomach is finite, and you cannot eat enough greens to maintain your body weight, much less your energy and enthusiasm for life, eating so little. You'll eventually have no choice but to add other foods to your diet. Either you start eating high-fat foods again, in which case candida will cause you problems once more, or you go with carbohydrates and embrace low-fat raw fruits as your calorie source. The best candida cleanse is to eat all the fruits and vegetables you care for, eat no overt fats for a few weeks, and watch your health and vitality soar. Learn how this diet can help your body reverse other diseases here. Find out what's healthy to eat on a raw food diet candida cleanse. Can't bear to give up your oil-based salad dressings? 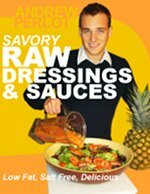 Learn to make amazing low-fat dressings and sauces for your salads using only fruits, vegetables, and herbs. 1) Ryan KJ; Ray CG (editors) (2004). Sherris Medical Microbiology (4th ed.). McGraw Hill. ISBN 0838585299. 4) Pirotta M, Gunn J, Chondros P, Grover S, O'Malley P, Hurley S, Garland S. Effect of lactobacillus in preventing post-antibiotic vulvovaginal candidiasis: a randomised controlled trial. BMJ. 2004 Sep 4;329(7465):548. 5) Jeavons HS. Prevention and treatment of vulvovaginal candidiasis using exogenous Lactobacillus. J Obstet Gynecol Neonatal Nurs. 2003 May-Jun;32(3):287-96.